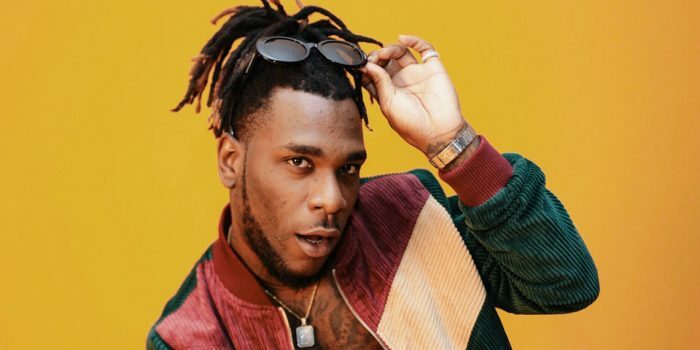 Burna Boy has been in the news lately following his outburst with organisers of the 2019 Coachella festival for putting his name in small fonts in their flyers. ‘I know for a fact that my own country, NIGERIA is home to the largest number of backward Unprogressive FOOLS. I will still fight for them because they are not mentally advanced enough to fight for themselves’. Nigerian singer Burna Boy may be at the top of his game right now, he may be getting much buzz for his music in and outside Nigeria, but how long can he maintain this newfound stardom without messing up? I’m a ‘good music’ lover and I won’t hide the fact that Burna Boy is a talented musician who should be respected for what he has done in the music industry. Being one of the most creative musicians to come of the West African country, Burna Boy has consistently believe he can keep promoting his craft with ‘unprogressive’ controversies that are doing no good to his career other than ‘backwardness’. It is evident enough that he hasn’t learnt from why he went out of spotlight initially, which he worked tirelessly to recover again – going from being A-list artiste to an upcoming artiste and now an A-list artiste. 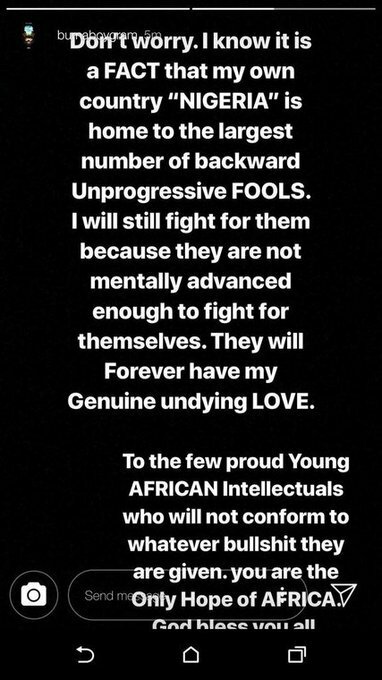 Burna Boy’s not too pleasant personality, proud and aggressive attitudes towards his fans and Nigerians in general were among the reasons he relegated at first, now that he has the limelight, he has yet again started emitting these toxic characters. What a shame! Having the talent and money to promote yourself are not enough to be a successful artiste anywhere in the world if you cannot respect those consuming your music and those who will do anything to show you love. Before I dwell so much on this unpalatable post of the ‘Boy’ about Nigerians, I’ll give you a benefit of doubt, because you’ve swallowed your words by deleting the post. However, you need to have this at the back of your mind, the fans who saved your career the second time will not do that for you the third time, if you continue to disrespect them. Whenever you’re frustrated about any situation, be reasonable enough to address it appropriately. I leave you with peace and love.